The American Biogas Council (ABC) and the US Composting Council (USCC) announced today the signing of a Memorandum of Understanding created to help accelerate the growth of the organics recycling industry. High tech veteran joins residential energy efficiency company to head up software development, information systems and network operations. According to EnergyTrend, a research division of global market research firm TrendForce, global photovoltaic (PV) market is not expected to post big fundamental change in terms of industry structure nor ASP trend in 2013. Results from the world's first flight powered by 100 percent biofuel that met petroleum fuel specifications without blending were released today by the National Research Council of Canada (NRC). Test results show reduced emissions and better fuel efficiency than petroleum jet fuel. Today, the shortlist was announced for the 2nd annual Solar Power Generation USA awards. Twelve entries in the categories of Best Solar Collaboration, Best Solar Project and Most Innovative Solar Company have been whittled down from a large number of very high calibre nominations submitted over the course of the past 4 months. Winners will be announced on Tuesday January 16th, in front of an audience of 300 solar professionals at the 5th Annual Solar Power Generation USA congress in Newport Beach, California. "Biofuels represent the most immediate access to low-carbon transportation"
Due to the popularity of our sale, we are extending it to January 15th, 2013! Serving over 8000 students a year from all over the world in SEI's Online Campus, the world's leading professional solar training provider kicks off another year of offering technical and rigorous training in the renewable energy industry. Extract maximum power production from every roof size and shape. HIT® AC Series combines the module efficiency of Panasonic solar panels with the intelligence of Enphase microinverters. A built-in IQ 7X microinverter with Individual MPPT (Module-level Power Point Tracker) tracking helps deliver an all-in-one module that offers design flexibility, reduced installation time, and a higher ROI. 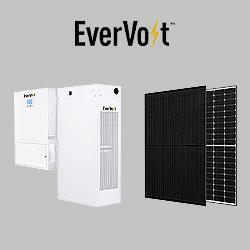 Field-replaceable microinverter with no DC wire management required yields lower cost of ownership.